1970's Levi's Jeans. - Orange Tab. Color: Blue Indigo. - #530 factory number on back of button. • SIZE: 30x30. • SIZE: 30X30. (See pics) Has an orange tab, Big E. The material is very strong. • COLOR: Blue denim. • MATERIAL: 100% cotton. However these signs of wear and imperfections are normal. Antique copper tack button and rivets. Naturally distressed. Label: Wrangler – Made in USA. Rigid cotton denim. Waist: 37”. Fabric: 100% Cotton. Classic 5-pocket style. Color: Dark Blue. Flares Sta-prest. Bell Bottom Pants. COLOR: DARK BLUE DENIM. MADE OF: COTTON DENIM. WIDTH: WAIST 34. LENGTH: INSEAM 31. FRONT RISE:11.5. If you are very particular, then used clothing may not be for you. CONDITION: NICE NEW UNWORN. This item has been laundered and is ready to wear! Inseam- 29.5”. Feature pinstripe, Made in USA, Never Washed or Worn. Pristine Condition. Regular Fit, Straight Leg, 100% Cotton. Nice old distressed camo pants. “V” single stitch notch on top closure. Blue denim body. Has a brass Talon 42 zipper in fly. MADE OF: COTTON DENIM. FRONT RISE: 13. COLOR: DARK BLUE. LENGTH: 30. If you are very particular, then used clothing may not be for you. These jeans are by Levi’s and are a size 32 waist by 30 length. It is a 505 style and has a red tab. They are well worn and distressed, see photos. They measure 32 inches at the waist, 39 inches at the hip, 39.5 inches from top to bottom, with a 12 inch rise and a 29 inch inseam. Please contact me with any questions and take a look at my other items! Textile is unmarked, denim. Wrangler light wash distressed jeans. Two front pockets and two back patch pockets. Bell bottoms. Small hole below the left belt loop, one in the back waistband, and a larger hole in the back right pocket. ALL COTTON LIGHT AND CRISPY CORDS! Small "e" on the Levi's gold tab with red letters on the back right pocket. Flare bell style "with an extra skoosh.". Single stitch at top waist and on cuffs. Waist: 32". Color - light blue. Outer-seam: 40". Leg opening: 11". Inseam: 30". Made in USA. MADE OF: COTTON DENIM. CONDITION: NICE HAS A FEW SMALL PINHOLES ON THE SEAT, AND SLIGHT WEAR ON THE CROTCH SEAM ( ALL MINOR). WIDTH: WAIST 33. (HOUSE REFERENCE). FRONT RISE: 12. COLOR: LIGHT BLUE. LENGTH: INSEAM 30. In mint and never worn condition. Size: 33 x 30. Worn Maybe Once or Twice! Size Marked: 36x32. The jeans still have the tool suspension loop on one leg, as well as a neat slot pocket above the hip pocket on the front left. Size and washing instruction label is still present inside. Herringbone woven denim. Label/Designer: Walls. Elastic back waist. Smoke Free! We are a non-soking household. Fabric: 100% Cotton. Shoulders - 19. Color: Blue. Lee Riders Jeans Vintage 70s 38x30 Talon 42 Zipper Union Label Made in USA zip fly with talon 42 metal zipper, five pocket, fading on upper thighs and knees United Garment Workers of America Union Made. Tag states 38x30 Actual Pant Measurements Flat Waist: 18.5 " Inseam: 28.5"
Really sweet distressed worn jeans. Shoulder seam to leg hem- overall length-approx 62". There's Approx 12" from waist to chrotch so they are long. 44-30" Actual size. waist band width is 22". 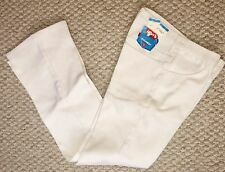 Rare DEADSTOCK Lee riders 200 Indigo Denim jeans. Sanforset Union Made in USA . Tag size 42 . Length 30 . Measures Measures waist X length Condition is new . Hard to find in this .condition & size check pics !! 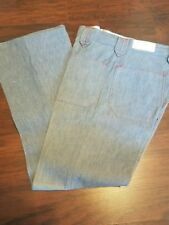 LEVI"S BIG E Vintage Chambray Denim Slacks Early 70's 38 x 30 Good Cond Rare! !